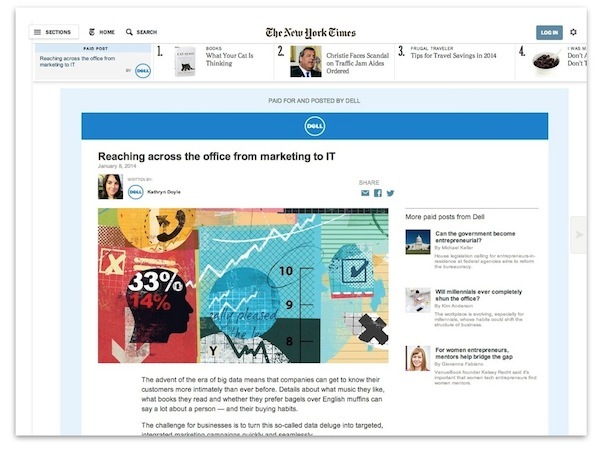 The New York Times has taken the wraps off its first foray into native advertising, publishing paid content on behalf of Dell. Coinciding with a redesigned nytimes.com, a new subdomain at http://paidpost.nytimes.com is the first thing that distinguishes paid content in the publication from editorial content. 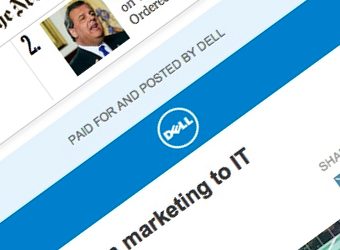 This page was produced by the Advertising Department of The New York Times in collaboration with Dell. The news and editorial staffs of The New York Times had no role in its preparation. The New York Times has been tentative in embracing native advertising, a format which has increased in prevalence across the web as publishers seek to replace falling print advertising revenues that can’t be replaced easily by the low value of online display advertising. Executive editor Jill Abramson has expressed reservations about native advertising, and along with the high-profile and respectability of The New York Times, has led to the result unveiled today and the clear labelling employed.